Click on the photo to see a larger image. A series of adjacent vacant properties (214-230 Sherbourne) are up for sale just steps from the south-west intersection of Dundas and Sherbourne. The owners want to sell the property to condo developers. We’re calling on the City to purchase the property, and if necessary, to expropriate it for building social housing. The average market rent in Toronto is over $1000 for a bachelor, over $1200 for a one-bedroom, and over $1400 for a two-bedroom apartment. Single people on social assistance receive a maximum of $721 or $1150, depending on whether they’re on Ontario Works or Ontario Disability Support Program. Even people earning the new minimum wage, a 21% bump over last year, must spend over 60% of their income on rent to secure a one-bedroom apartment. With a sizable plot of land up for sale just steps from Dundas and Sherbourne, the threat of homes for the wealthy being built in a neighbourhood overwhelming populated by the poor is very real. Based on work we’ve done thus far, a motion to get the City staff to look into purchasing or expropriating the plot of land will go to City council on Tuesday, March 27. While a positive vote will help, turning back the tide of encroaching gentrification will take a fight. Thankfully, this neighbourhood has a long history of resistance. Join us and let’s fight to win social housing at Dundas and Sherbourne. Update, March 27, 2018: The motion referenced above passed, which means staff at the Affordable Housing Office now have the mandate to pursue the purchase of the property. This does not, however, mean the property will be purchased by the City. A report will now be produced at the Affordable Housing Committee meeting on June 25 which will provide further insight into whether the City will pursue the purchase. We will post more information as it becomes available. Update: June 26, 2018: The owners of 214-230 Sherbourne took the properties off the market. The owners seem to prefer to sell to developers willing to pay more than the already inflated market price. The affordable housing office has been directed to develop a general “affordable housing real estate acquisition/ expropriation strategy,” but they are choosing to not pursue the expropriation of 214-230 Sherbourne at this time. The motion does mention that if the properties were to be listed again before the end of the year, the affordable housing has the authority to put in a “conditional offer” to purchase the properties. But a conditional offer that’s contingent on council approval, which could take months, is likely not going to enough to stall the purchase of the properties. In the midst of a deadly housing crisis, there is no good reason to not proceed with expropriating these properties now. Downtown East Toronto, one of Toronto’s oldest working class neighbourhood, is being threatened by gentrification. This gentrification, which began in the mid 1960’s, has intensified over the last fifteen years. Working class people and the unemployed, who have been welcomed in Downtown East Toronto since the mid 1850’s, are now being displaced by large developers speculating and buying up property in the neighbourhood. Thousands of rooming houses, which have served as cheap housing for the poor, have disappeared from here. The corner of Dundas and Shebourne remains one of the most important part of our neighbourhood. All Saints Anglican Church, which has served as a community centre since 1970, sits on the south-east corner. 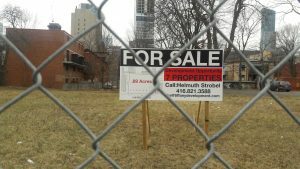 However, the valuable land located in and around Dundas and Sherbourne area is now being targeted by speculators and developers who are hoping to cash in. 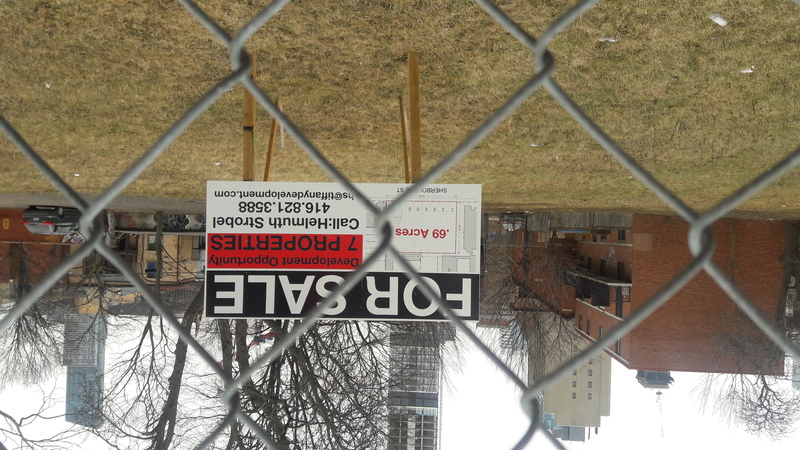 A property located on Sherbourne St. just south of Dundas Street East, just across from All Saints Chruch, is now being offered for sale to developers for a potential 23-storey condo development. On the site sits a large abandoned Victorian House, which had operated as a rooming house since 1914, and which has now sat empty for more than a decade. Two other houses adjacent to 230 Sherbourne, which also operated has rooming houses for decades, were demolished several years ago by the owners, and now only an empty lot remains. The poor have a long history of fighting for housing at Dundas and Sherbourne area. In 1970’s the City of Toronto was facing a crisis as more and more rooming houses were disappearing. The city eventually bought up more than a dozen rooming houses on Sherbourne St., just north of Dundas Street East, which continue to operate today. More than forty rooming houses were also saved, and bought by the city, in the late 1970’s, after poor people fought back against speculators buying up rooming houses during the St. Jamestown redevelopment. In the mid 1980’s, after Drina Joubert was found frozen to death at the back of a rooming house across the street from All Saints Anglican Church, a large coalition was formed calling on the Ontario government to build social housing for single adults. This battle resulted in the subsequent building of 3,000 units of social housing for single adults, including 61 units at Dundas and Sherbourne, behind All Saints Church. On a nightly basis more than 100 people are sleeping on mats at All Saints Anglican Church, one of seven respite sites funded by the city this winter. A few blocks west of Dundas and Sherbourne, on George St., another respite centre, 100 people are also being sheltered in an old youth detention owned by the province, every night. As the city’s shelter and housing crisis continues to intensify we cannot allow developers to displace the poor and the unemployed, who had always been welcomed in Downtown East. In order to continue to ensure that this community keeps its working class identity we must protect it.